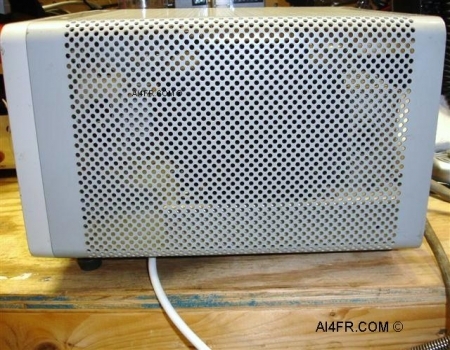 The 516F-2 power supply can be used with many of the Collins transmitters and transceivers. The 516F-2 runs from a 115 volts AC 50/60 Hz power source to provide the high voltage DC, low voltage DC, variable DC bias, and an AC filament supply. 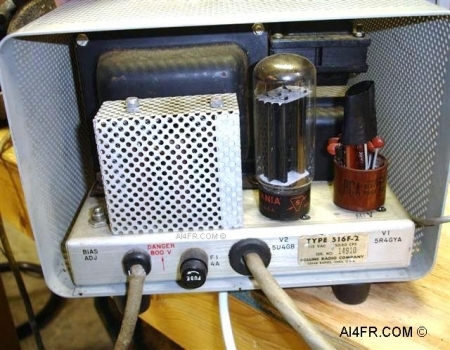 The provided voltage from the 516F-2 is connected to the associated equipment by a 60 inch long gray cable. 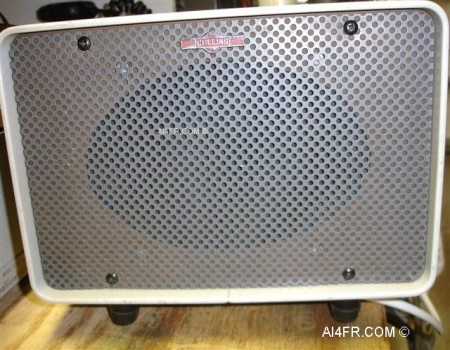 As was the case with many of these power supplies they were often modified to include a speaker as is the case here. The size of the 516F-2 is 10 inches wide by 7 3/4 inches high by 12 inches deep and weighs in at 28 pounds. As can be seen, at present this power supply along with the KWM-2 is first in line to be restored and is on the work bench as I type this. More pictures of the process are soon to follow. 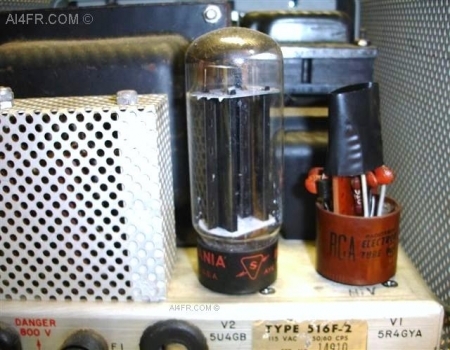 Another modification of the 516F-2 power supply was to change out the 5U4GB and the 5R4GYA full wave rectifier tubes with solid state components. Collins engineers actually recommended this solid-state conversion in SIL 1-76. This SIL 1-76 is not an official service bulletin but it does show the concern that Collins engineers had with the tubes arcing over. Another advantage of adding this solid state modification is the reduction in filament current by removing the two rectifier tubes. Not only does this make life a little easier on the transformer, it also reduces the heat that the transformer absorbed due to its location near these two tubes. Even if this solid state modification is done correctly it can still be a source of heated debate amongst owners of the 516F-2. There is two reasons that come to mind, one is that it may be possible that there will be B+ on the plates before the filaments are at operating temperature, and the second reason is that you are taking a tube rig and turning it into some thing more modern and with less tubes. A special thanks to Steve Fitzgerald(N4KQR) who personally hand delivered this item.